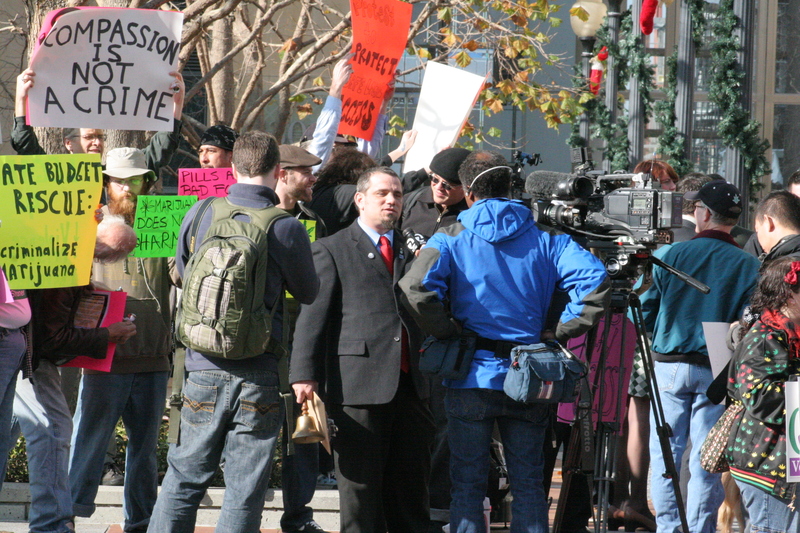 OAKLAND, CA — Medical marijuana defendants Michael “Mickey” Martin and Jessica Sanders got a break in federal court on Wednesday. In spite of felony convictions, the two will not serve any prison time for their involvement with the production and distribution of marijuana-laced foods. This outcome was no accident, however. By all appearances, it was the result of numerous converging factors – adept argument by defense attorneys, easing of opposition from the government, prudent consideration by an open-minded judge and a highly-visible show of support from the activist community. Wednesday’s sentencing hearings were the final and most anticipated proceedings in a case that spanned nearly a year. It began with a federal investigation of the edibles company, which was operating as Tainted Inc. and producing knock-offs of classic candy treats. Its product that resembled “Snickers,” for instance, had a label design that mimicked that of the mainstream candy bar, but called the marijuana-infused version “Stoners.” The packaging was just whimsy, though. The candy bars were destined for dispensaries, where they were distributed to medical marijuana patients for the very serious purpose of alleviating symptoms of illness. On September 26th, 2007, after two years of investigation, federal agents executed searches of Tainted Inc.’s business facility and four houses associated with employees. Sanders’s dog Doobie was shot twice in the scuffle, while Martin was declared a fugitive simply because he wasn’t available for arrest. He later surrendered himself and made bail, joining Sanders and two other employees as they awaited prosecution. The arraignment took place last February, leaving Martin and Sanders facing felony counts. The other two defendants, Diallo McLinn and Michael Anderson, were charged only with misdemeanors for allegedly making deliveries of Tainted Inc.’s products. McLinn and Anderson pled guilty to charges of “aiding and abetting the possession of marijuana” and were sentenced to two years of probation. In March, Martin made his plea bargain, accepting guilt on a count of conspiracy to manufacture a mixture or substance containing marijuana. Sanders followed soon afterward with a guilty plea for using a communication facility to distribute a mixture or substance containing marijuana. As they waited for sentencing, Martin and Sanders were acutely aware of the worst-case scenario: five years of prison for him, four for her. By the time Sanders’s sentencing occurred, however, the worst-case scenario had become pretty much impossible. After the necessary assessments, all parties had settled on a sentence between six months and one year. In addition, the probation officer eagerly backed the defense’s request for home confinement rather than prison. In the span of a few short minutes, Judge Wilken pronounced the sentence for Sanders: a term of three years of probation with six months of home detention and a hundred hours of uncompensated community service. The proceedings would not be nearly so brief for Martin. True, he had a more involved role in the business and he had a slightly more serious charge…but another reason for the lengthy proceedings was that Tony Serra was on the defense team. As part of his theatrical address, Serra has a tendency to stress and project nearly every syllable of every word. Since the defense was arguing against the government’s request of a 30-month sentence and probation’s recommendation for a two-year prison term, there were plenty of reasons for discourse. And, with the judge requesting a lesson in state medical marijuana law, there was plenty of opportunity. “What is the status of the law, with respect to California law and what it allows?” Judge Wilken asked, her interest genuine. Assistant U.S. Attorney Keslie Stewart gave a more straightforward response, but uttered it more bashfully than such an assertion might otherwise warrant. “It is my understanding that federal law preempts everything with regard to California law,” she said. The judge wasn’t satisfied – she had wanted a more literal answer. Instead, the attorneys had jumped ahead, anticipating a discussion of how conflicting sets of federal and state laws should be managed and prioritized. Judge Wilken, in the meantime, was simply curious about how the state medical marijuana law worked. She had heard enough about what wasn’t permitted. “What does California law allow?” she asked again good-naturedly. Something more solid was required, and Serra obliged. As soon as he began his speech, however, a verbal slip-up had the judge and the attorneys in giggles. He inadvertently combined the numbers 215 (for the medical marijuana proposition approved by the California electorate in 1996) and 420 (for the senate bill that made a legally-disputed attempt to modify the law several years later), and mistakenly launched an oratory about what was “legal under 415.” The gallery, which was crammed tight with medical marijuana activists, murmured earnest corrections to each other, but at the bench there was a lighter mood. 415, as it turns out, is the penal code for disturbing the peace. The oft-vociferous Serra gave a laughing smile as he acknowledged his familiarity with this law. “I’ve been accused but never convicted!” he declared, his index finger jabbing the air for emphasis. The jokes served to break the ice in what was a tense and highly scrutinized hearing. In a cheerier atmosphere, Serra made a second run at giving an oral history of state medical marijuana law, and he was more properly aligned this time. He took the judge through an overview of the milestones in the legal evolution, starting with the fact that the law doesn’t specify amounts and that a “reasonable need” standard was initially used in determining appropriate quantities. Serra admitted this determination could be highly subjective, and explained that many counties began issuing quantity regulations in order to make the matter more clear. Oakland and certain northern localities, he pointed out, set limits at 99 plants per patient. When the first guidelines from the California Attorney General came down, however, they called for a maximum of two plants per patient in counties that didn’t set their own specific regulations. This development was followed by Senate Bill 420, which set forth the numbers of six mature plants and twelve immature plants per patient. These figures were intended as the minimum plant amounts that could be allowed in any locality, and as such, they could be modified by county boards or overridden in cases where a patient’s doctor specifically recommended a higher quantity. Nevertheless, an appellate court just recently ruled the plant numbers in Senate Bill 420 unconstitutional. 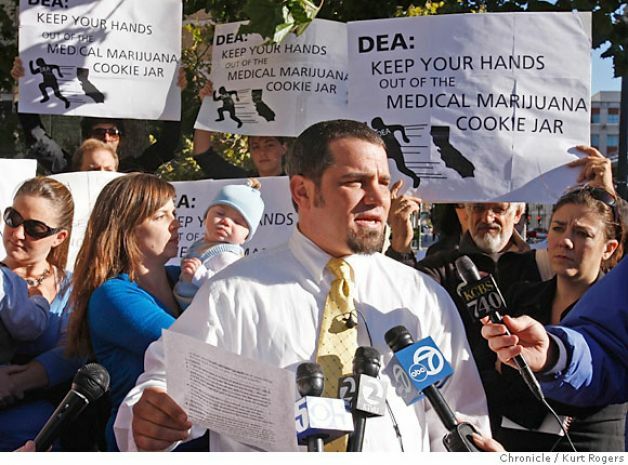 The matter is still in the appeals process, but Serra argued that the legal effect of the ruling was to revert to the old standard – that the amount of marijuana possessed by a patient must be “reasonably related to current medical needs.” In a nice bit of narrative fulfillment, this brought his lecture full-circle back to its starting point. The judge’s next matter of inquiry focused on documents the defense had filed regarding efforts to change the scheduling of marijuana. It’s currently in schedule I, a category for drugs with a high potential for addiction and no established medical benefit. However, Serra related a recent experience in U.S. District Court in Fresno that spoke against this categorization – after filing a series of affidavits about marijuana’s medical efficacy, the government had been unable to round up any witnesses to counter the claim. “The U.S. Attorney couldn’t find one doctor who could say there’s no medical efficacy,” he announced with pride. If marijuana were rescheduled, Serra speculated, it would reduce the federal government’s power to harass medical marijuana providers and subject them to civil and criminal litigation. “Schedule I will be dumped,” he said confidently. Judge Wilken was smiling and nodding conspicuously by this time. She seemed won over, and appeared to have no concerns about Serra crossing the line of campaigning in the courtroom. She did, however, have one point of confusion: if marijuana was moved from schedule I to schedule II, wouldn’t there still be problems with access? “Schedule II drugs can’t be passed around,” she remarked. Serra looked up at her, shooting her his most charming smile. “We’re going for schedule III,” he said with buoyancy. Then, turning to the onlookers, Serra asked everyone who was present in support of his client to rise. After a moment of shuffling, just about everyone in the packed pews was standing. “It’s practically the entire audience,” Serra observed, stating for the record that the seats were filled almost to capacity. There was a moment of hushed awe, and then Serra thrust forward with his speech. But, looking out at the crowd of standing spectators, the judge quickly put up a hand to halt him. “May they sit down?” she asked, ostensibly aware of how long even a succinct statement by Serra could last. Martin may not have turned a profit with his company, but Serra maintained that the products had helped people. “People depend on it for their health, and in many cases their survival,” he said of medicinal candy. The defense attorney also acknowledged that his client was targeted for prosecution because he made this specific type of medicinal food. “If this wasn’t candy, he wouldn’t be here,” Serra speculated. “Candy might seem frivolous – something to recreate behind rather than true medicine…but the opposite is true.” He then commented that medical marijuana dispensaries stock medicated confections as standard products for their patients. Moving on, however, Serra made it clear that his client’s life was about more than medicinal candy. He cited several impressive parts of Martin’s informal résumé, including involvement with the Special Olympics, coaching his son’s Little League team, and his family focus as “a doting father.” In the defense attorney’s estimation, Martin was a tremendous asset to his community. Sara Zalkin, the other attorney for Martin, was given the floor next. Calling her colleague “a tough act to follow,” Zalkin started off her speech by commending the judge for “honing in on the rescheduling issue.” It has been a source of great frustration, Zalkin said, especially because a DEA administrative law judge recommended the rescheduling of marijuana over twenty years ago and no action has taken place. As she made her final entreaties, the defense attorney manifested a glow of sincerity. From the wholesome beauty of her cherubic face to her deeply empathic eyes and her halo of softly curling hair, Zalkin looked every bit the part of a guardian angel. And, like the most valuable of guardian angels, she was packaged in a smart business suit, armed with an expert command of the law and fueled by a passion for legal advocacy. Not everyone shared the defense attorneys’ golden view of Martin, however. The prosecutor, quite predictably, took aim at the former candymaker when given the opportunity. “This issue went up to the Supreme Court,” Stewart declared, offering U.S. v. Rosenthal as her precedent. It was a citation that would be challenged later by Martin himself. “The Court found that the federal statute preempts state law,” the prosecutor summarized. Martin was also allegedly growing over four hundred marijuana plants at the time of his bust, and the prosecutor asserted that he had already been given leniency by not being charged for these plants. “Four hundred plants is well above our intake threshold,” Stewart remarked, indicating that the charge could easily have landed the defendant a five-year mandatory prison sentence. She also claimed that the cultivation had been quite profitable for Martin, and suggested that he had supported his family for two years on earnings from it. Judge Wilken very nearly scoffed. “I think it’s appropriate to consider state law,” she tossed back at the prosecutor. The judge seemed sure on this point, even though it was the first time she had encountered medical marijuana issues at a sentencing. The prosecutor had nothing. “I remember I heard there was a concern,” Stewart said. Ultimately, she was unable to provide any information beyond this. Once Martin’s probation officer got a chance to comment, Stewart appeared to recognize the inevitable outcome and pull away in retreat. It may have been the judge’s first medical marijuana case, but the probation officer had dealt with the issue before. Recalling the other cases he’d handled, the probation officer declared Martin to be “the first person who’s been intellectually honest” about his activities and involvement with medical marijuana. “This is a guy who really believes in something,” the probation officer said as he assured Judge Wilken that Martin’s sentence could be served in community confinement. But before that was decided, Martin was given the chance to address the court. He began with a few corrections, pointing out that the company’s name had changed from Tainted Inc. to Compassion Medicinal Edibles. Next, he tried to set the prosecutor straight on her precedents. “I believe the case the government is talking about is Raich v. Gonzales,” he said confidently. These matters aside, Martin moved on to the more substantive part of his speech. For this, he quoted Bob Dylan as saying, “A mistake is to commit a misunderstanding.” Martin openly admitted to committing a misunderstanding, but he wanted to be able to outline the levels of misunderstanding that led him on the path to a mistake. “The first misunderstanding was with my body,” the defendant claimed. He then referenced a psychiatric hospitalization at the age of twelve and a diagnosis of Attention Deficit Hyperactivity Disorder that put him on Ritalin. “This medication made me feel socially awkward and unstable, and I found at a young age that cannabis helped me focus much better and live a fuller life,” Martin revealed. He went on to detail another incident, in 2002, when an injury to his heel required reconstructive surgery with seven screws and a steel plate. He became addicted to the opiate painkillers he was prescribed, and again found relief with medical marijuana. The next misunderstanding that Martin put forth was a legal one, involving “the voters of the State of California who passed laws some twelve years ago to allow for the use of cannabis as a medicine.” He continued, “Twelve other states have also passed similar legislation. The California State Assembly has passed legislation directing the proper use of cannabis as a medicine. The California Supreme Courts have affirmed patients’ rights in many different cases.” And, as Martin explained, the California Attorney General recently passed guidelines about medical marijuana that were tacitly affirmed by the U.S Attorney for the Northern District of California. “I believe it is the ambiguous misinformation like this that clearly creates areas of misunderstanding, and puts the public in harm’s way,” the defendant suggested. As observers in the gallery finished wiping away their tears, Judge Wilken proceeded with the sentencing. She would be following the probation office’s recommendation for a 24-month sentence, she said, but it would be split between twelve months in a halfway house and twelve months on home detention. The judge also imposed a term of five years of probation, but ordered no fines or restitution. Smiles broke out amidst those in the crowd, and they listened attentively as Judge Wilken recited a list of the reasons why she elected not to send Martin to prison. These were: his family and community relationships, the fact that he “appeared not to be focused on a major profit,” his admission of breaking federal law, his provision of “what he saw as a service to ill people,” the lack of clarity that comes from having conflicting state and federal laws, and the absence of any indication that the products were diverted to anyone who didn’t qualify for medical marijuana. When informed of Martin’s upcoming knee surgery, the judge assured the defense attorneys that the sentence would be flexible enough to accommodate their client’s recovery process. And that was that. The decisions were made and the hearing was over, but a slouch into silence seemed far too anticlimactic an ending for an audience that had laughed and cried its way through the afternoon. One enthusiastic pair of hands clapping turned quickly into two and three and four…and very soon the fervent applause had spread across the entire gallery. This was how the Tainted Inc. courtroom saga came to a close, with dozens of supporters on their feet and cheering for the freedom of their friends. The case had four arrests and four convictions, but there would be no prison time for any of the Tainted defendants. It was enough of a happy ending, the activists decided, to get a standing ovation.